The New Year is swiftly approaching and we’re clearing out old stock to make way for new treasures. 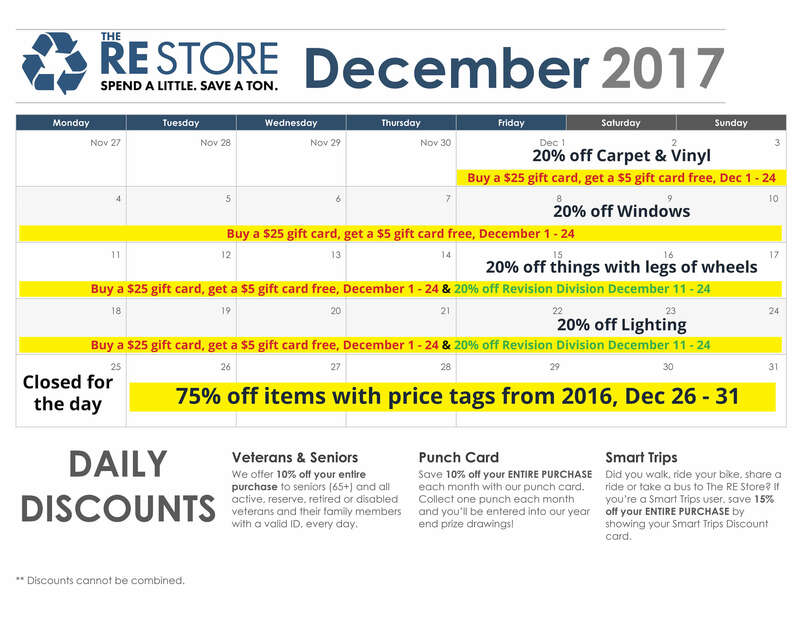 Prepare for holiday visitors with 20% off carpet and vinyl, replace leaky windows or prepare some fun DIY projects with 20% off windows, increase your counter top space with 20% off things with legs and wheels, and brighten up dark spaces with 20% off lighting. From December 26-31 we’re cleaning out the old to prepare for the new with 75% off items with price tags from 2016. From December 11th – 24th, save 20% off all Revision Division items, in store and on Etsy with Etsy coupon code TAKE20. Save even more with a buy-one get-one gift card offer from December 1st – 24th. Purchase a $25 gift card for friends or family, and receive a $5 gift card for yourself.